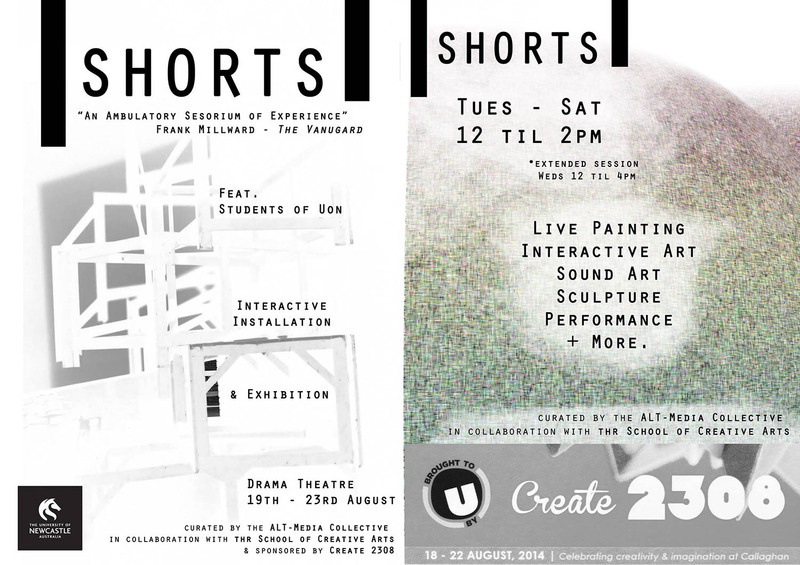 Shorts was a five-day transformation of a drama theatre into a place where ideas could be explored. The transformation was part of the University of Newcastle’s Create2308 creative festival in August 2014 and was curated and produced by the ALT-Media collective of Louisa Magrics, Tim Buchanan and myself. There was no particular theme to the show but the objective was to provide an environment where the participants perceptions of a drama theatre were disrupted and a stage was set for the presentation of a diverse range of unconventional and ephemeral artworks. Entry to the theatre was by the conventional theatre route but this was transformed into a form of birth canal with disturbing sound and vision in a dark corridor created by Tim Buchanan’s AV glitch work. The intent here was that the participant’s perceptions would be ‘reset’ in some way by the stimulation overload and they would be more open to new or different ideas. From there on the space became one of strange sounds, images, objects, experiences and performances that provided what Frank Millward referred to as an ‘ambulatory sensorium’. Individual artists and three class groups from Fine Art and the Performing Arts contributed about 50 artworks and performances that involved about 47 students and 10 staff and had visitor numbers approaching 350 over the 5 days. Credits: some photographs on this page are the copyright of Murray McKean (mckeanphoto.com.au) or Louisa Magrics.